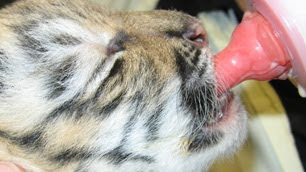 In my last post re the birth of 2 tiger cubs at the Calgary Zoo (in which the Zoo had no idea the female was pregnant), I reported that one cub had died and the second was in intensive care. Alas, that cub has died as well. Zoo officials say it died of severe head trauma after being carried too firmly in the mouth by its inexperienced mother. Of course, if the zoo had known what they were doing, perhaps both cubs could have survived. I still want to know why the zoo remains open. Lets see the Dog Whisperer do this! !